In the early '80s, Genesis would've been considered prog-rock sellouts had they lacked a knack for great pop. But hey, they didn't; the excellent Duke, released in 1980, proved this. Though the album contains complex time signatures and intricate arrangements, what stand out are its hooks. Obviously soaking up all the new wave then conquering the charts, Genesis streamlined their sound, adding heaping doses of synthesizers and punchy sonic tricks in the process. 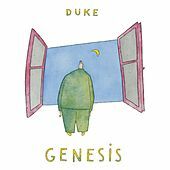 Duke's peak comes with "Misunderstanding," a slice of blue-eyed soul that features a great vocal performance from Phil Collins. 1980 Philip Collins Limited, Anthony Banks Limited, Michael Rutherford Limited under exclusive license to Atlantic Recording Corporation for the United States and WEA International Inc. for the world outside of the United States.